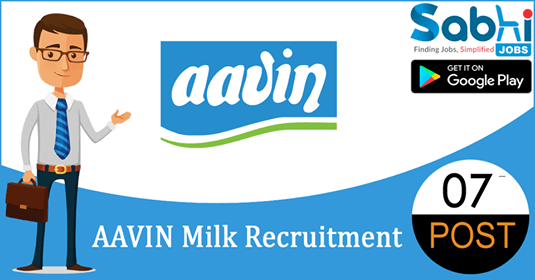 AAVIN Milk recruitment 2018-19 notification has been released on official website www.aavinmilk.com for the recruitment of 07 vacancies at Tamilnadu Cooperative Milk Producers Federation Limited. The candidate who is looking for Executive (Office), Junior Executive & various vacancies can apply offline application on or before 14th August 2018. Junior Executive: Must be a Graduate in any discipline. Must have passed in Co-operative Training as detailed in Rc.No.51928/2013/SF2, Dated 18.07.2013 of the Registrar of Co-Operative Societies, Chennai, Exemption for holder of degree in B.A. (Co-Op) or B.Com (Co-Op) from Passing Co-operative Training. How to Apply Interested and Eligible applicants may apply in prescribed application form along with photocopies of required documents send by Registered Post or Speed Post to The General Manager, Sivagangai District Co-operative Milk Producers Union Limited, Kazhanivasal, Karaikudi-2, on or before 14th August 2018.